VANCOUVER, March 6, 2019 /PRNewswire/ - Victory Metals Inc. ("TSX-V:VMX") ("Victory" or the "Company") is pleased to announce an additional seven reverse circulation ("RC") holes completed at its Iron Point Vanadium Project, located 22 miles east of Winnemucca, Nevada. Including these seven holes, Victory has now released results for 15 RC holes from a planned program of 69 RC holes and four diamond drill holes. 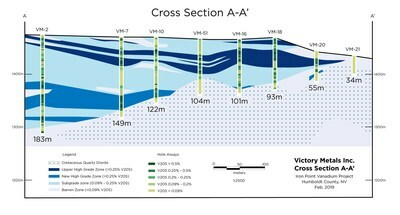 The seven holes reported today were drilled vertically along a north-south trending long section line (see Figure 1, B-B') that bisects the east-west trending cross section line A-A' (see Figure 1), the results for which were previously released (see Victory's February 28, 2019, news release). A review of these new drill results indicates that the flat lying Upper and New High Grade zones previously interpreted on an east-west cross section are also continuous in a north-south direction over a significant strike distance (580 meters N-S, and open). Note that hole VM-07 is common to both section A-A' and section B-B' and is helpful in tying these two sections together. The two completed and released drill sections (utilizing 15 RC drill holes) confirm the lateral and depth continuity of vanadium mineralization in the Upper and New High Grade Zones, as well as the extent of the lower grade vanadium mineralization envelope. 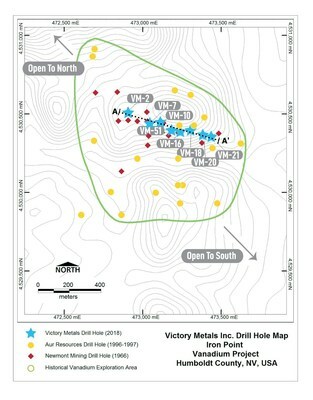 Collin Kettell, CEO of Victory, stated, "The first drill holes from our maiden drill program demonstrated continuity on an east-west trending section, over a distance of at least 525 meters. These new results have demonstrated that these interpreted higher-grade zones also continue for at least 580 meters along a north-south trend. This provides Victory with a well-defined, cohesive "core" zone of mineralization from which to expand outward with additional drilling. These results provide Victory with a strong platform from which to further expand mineralization." Assay results for intercepts released today are reported in % V2O5. Intercept lengths are deemed to be true thickness given the flat nature of the mineralized zones being tested by vertical holes. Intercept lengths are reported as an Overall Length, which includes all assay intervals within the vanadium blanket zone (at a 0.09% V2O5 minimum grade), and also as individual zone intercepts reported as aggregate lengths comprised of samples grading 0.25% V2O5 and greater. Victory owns a 100% interest in the Iron Point Vanadium Project, located 22 miles east of the town of Winnemucca in Humboldt County, Nevada. The project is located within a few miles of Interstate 80, has high voltage electric power lines running through the project area, and a railroad line passing across the northern boundary of the property. The Company is well financed to advance the project through resource estimation and initial feasibility study work. Victory has a proven capital markets and mining team led by Executive Chairman Paul Matysek. Major shareholders include Casino Gold (50%), and management, directors and founders (25%). Further, over 51% of the issued and outstanding shares of the Company (43,471,014 shares) are subject to an escrow release over three years.